Mash pears with the raspberries and sugar in a medium sized bowl with a fork. There will be small sized chunks in the mashed mixture which is okay. Refrigerate this mixture until ready to use. Add the mixture to the bottom of 4 champagne glasses evenly. Next add pear juice halfway up the glass then add the DASANI sparkling water the rest of the way up. 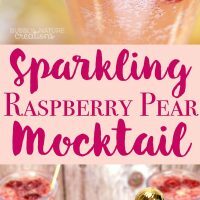 Add 3 raspberries to the top of the drink for a garnish.